Warner Bros. is moving ahead with their Willy Wonka reboot and they've got some very interesting, big names on their shortlist for the lead role. We reported back in February that Paddington director Paul King had been tapped to helm the project for the studio. Now it appears as though they're in the casting phase and are putting together a list of potential candidates to fill the very big shoes once filled by the legendary Gene Wilder. It looks like Ryan Gosling, Ezra Miller and Donald Glover at all on the shortlist. 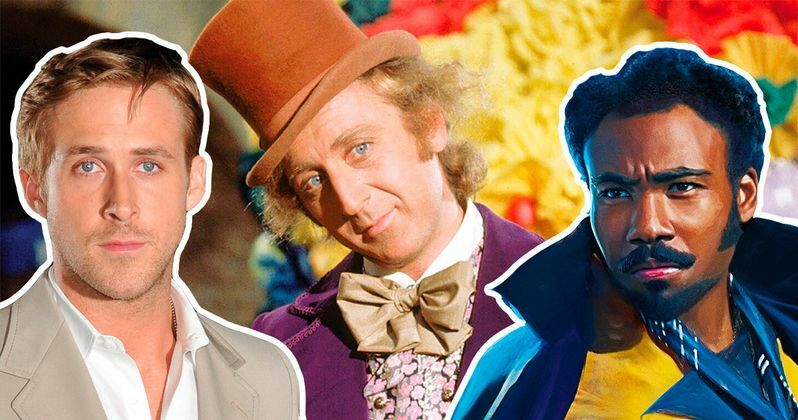 According to a new report, the trio of actors are in the mix to play a young Willy Wonka in what is expected to be a prequel set prior to the events of the classic Willy Wonka and the Chocolate Factory. We previously reported that there were rumors suggesting that Ryan Gosling was actively pursuing the role and it appears as though that may have worked, to some degree. At the very least, he's being considered and that makes a great deal of sense. He's partnered with Warner Bros. plenty in the past on projects like Blade Runner 2049 and The Nice Guys. From his point of view he hasn't really tackled a family-friendly project such as this, so it represents a new challenge. Donald Glover is the standout in this list. He's an entertainer that literally everyone seems to want to work with right now, and with good reason. The man is a rare talent. He's a massively successful musician, actor, writer and producer. It also would certainly be taking the character in a very different direction, but if anyone has the charisma to pull something like this off, it's Glover. Once he finishes filming the live-action take on The Lion King for Disney, he's pretty free as far as movie commitments go, but he's got Atlanta on FX and his music to worry about. Then there's Ezra Miller. Since this new movie comes from producer David Heyman and is set up at Warner Bros., this name makes a great deal of sense. Miller currently stars as The Flash in the DC movies and is featured in the Fantastic Beasts movies. Heyman produced the Harry Potter movies and is working on Fantastic Beasts as well. If he somehow winds up with the part, that would be three potentially huge franchises resting on the young actor's shoulders. Simon Rich (Man Seeking Woman) is penning the screenplay for this new take on the book by Roald Dahl. The last time we saw the material brought to the big screen was in 2005's Charlie and the Chocolate Factory, which saw Johnny Depp as Wonka and was helmed by Tim Burton. The reception to that take wasn't all that warm, but Warner Bros. is clearly going for something very different this time around. The Willy Wonka reboot does not yet have a release date. This news comes to us courtesy of Collider.